There are many different reasons you may want to build a garden wall and many different materials and designs to choose from. Maybe you want a garden wall at the front of your property and this along with your driveway or front garden this is the first thing visitors will see who come to visit. GJL paving & Landscaping can build your wall out of brick, Natural stone, block & render to name a few. You may want to add metal railings or timber panels, the design choices are endless. In the back garden you can add walls around the perimeter to make your garden secure or in sloped gardens retaining walls can help to level different areas to give you functional space. Walls can also be used to create raised flower beds and planting areas or just to add changes of level and interest. GJL paving & Landscaping will be glad to go through all the options available and carry out the construction to the highest possible standards. 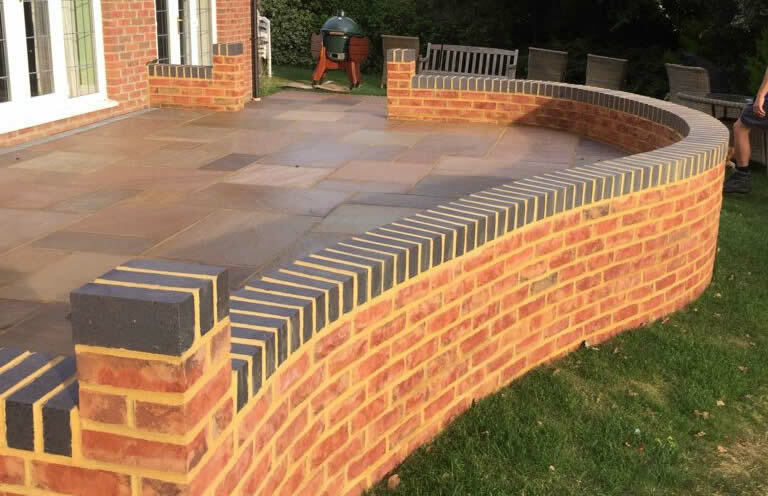 We can offer various garden wall solutions in the areas of Aldershot, Guildford, Farnham, Farnborough, Camberley, Reading, Basingstoke and Bracknell or any other area in and around Berkshire, Hampshire and Surrey.